Scott have been on my radar for a while, but hadn’t come to the forefront, until now. In the past 18 months, a distinctive line of product has stood at top of many podiums in the Ultra Trail World Tour and Sky Running World Series. The RC or Race Concept. One product has stood far above the others in the public domain, the Supertrac RC. Having sold out within the UK dealer network several times, us media types had to wait too. A sign of a product being received better than expected? Having graced the feet of Jo Meek, Andy Symonds and a spectrum of elite athletes onto podium success globally, it was about time I saw what the fuss was about. The Scott Supertrac RC stand out from the majority of Scott’s range. Much like Salomon’s S-LAB range, they are only available in one colour and are their ultimate version for the racer, though this time, all RC collection products are in black with yellow details. Designed to take on the toughest mountain running races, they combine an aggressive outsole with cushion to tackle everything from VK to Ultra. On the face of it, the closest shoe I’ve ran in to date was the The North Face Ultra Endurance, however, they lack the aggressive outsole. On the other end of the spectrum, I have been trialling the Hoka One One Mafatee Speed 2, which has a greater midsole…… long and short, this is something unique to my running. I’ve ran in many different terrains and locations in the Scott Supertrac RC’s, from the trails of Coed Y Brenin, the flanks of Ben Nevis, local trails and more. I’ve thrown sands, rock, bog, mud, tarmac and pretty much any other terrain and condition you can imagine at them. However, rather than start at the soles, lets get straight into the area you will see the most, the toe box. With small ribs along the toe box, which provide structure, despite its formidable look in striking yellow, it’s very flexible. Day to day running I found it wasn’t noticeable, but when descending Ben Nevis after a pre dawn summit raid in early June, I did smash my little toe after wedging it between two rocks. With the pain at the time I felt though looking substantial, the rand was little use and continued my run to the valley floor. But, given my toe was in one piece, nail survived and the pain had gone by the evening, I am led to believe my instant assumptions were incorrect. It could be tougher, but for 99.8% of the time, it’s more than adequate. Furthermore, rather than being constrictive, I have found the toe box is wide enough for longer runs. The Supertrac RC were my weapon of choice for Trail Marathon Wales, where on a scorching day, they carried me to 25th overall (ok, not quite Scott Elite Team material), and ticked the box for letting toes have some movement. Now, if there is any feature I am undecided on or share a love/hate relationship with, its the tongue and insole. The Supertrac’s tongue is comfortable and stays secure, thanks to a small loop on the upper. With ventilation holes in two areas, it does allow some air flow, despite being a solid layer, rather than a light mesh. The best way I can describe it is similar to a car leather chamois, though with pliability all the time. For me, it runs a little warm (if you’ve followed me for a while, you’ll know by now I run in shorts and T throughout winter) and in the summer, I have longed for greater breathability. One thing I will say though, one secure, in 150 miles, I didn’t need to readjust it once. So my love/hate…. I can’t make my mind up. The theory is great. Use a compound with genuine grip, to keep your foot in place when things get technical. I found out the hard way, when I first tried to put the Supertrac on without loosening the shoe off entirely. My sock gripped and I couldn’t put my foot in. Opening the laces up, it’s easy to get your foot in and once tightened, your foot and sock remain locked into position. In many ways it was a strange sensation when I started my first couple of runs, but quickly got used to it. The main issue is thicker socks. I constantly found thicker socks would engage with the insole and create folds underneath your foot. If you didn’t sort these out then and there, small hot spots appeared occasionally. Get it right and it’s great. I love the insole more than I hate it, so long as I take my time rather then rush out the door. A secure heel cup locks down well and balances cushion with performance. Cut low enough to allow for dynamic steps without rubbing, cutting down technical sections of Trail Marathon Wales or going off piste descending Ben Nevis, debris stayed out, my heel stayed secure and I remained comfortable. The No Sew Upper removes hot spots or seams to rub against and has held up well against the variety of running environments I’ve tested them in. Welded overlays provide structure and adds to durability. The upper isn’t the lightest mesh and does take a while to dry out, yet, where it compromises it gains for its ability to shed debris and protect the foot. I’ve yet to take my shoe off mid run to remove a small stone. Grip. I love it. Who doesn’t? The Supertrac RC has it in spade and takes a different approach to lug design. Whereas traditional lug designs call for uniformed patterns, with consistent lug depth, spacing and size. The outsole is covered in what Scott call 360° traction, which provides an alternate lug design for when you’re railing switch backs or changing direction on steep terrain. Beyond the lug design, the wet traction rubber compound combines to create a outsole that performs well across most terrain. Stopping short of full off trail fell running, I found they provided consistent, reliable grip. On fire roads, they tore through loose gravel and debris, on damp roots and off camber rocks, the Supertrac RC’s gripped hard, keeping me upright. On occasions where there were moving layers of trail beneath, I slid under control, able to predict the slide and continue running, without breaking step. With raised front and rear lugs, attacking ascents and/or remaining in control on descents is easy. Overall, the compound and grip perform well and exceptional on trails, regardless of angle or ground conditions. Finally, the cushion. I’ve had mixed experiences of trail shoes with a good deal of cushion. Scott’s Supertrac RC have a layer of Aerofoam+, which provides a comfortable layer of responsive foam, with little breakdown up to marathon distances. For road sections, the running dynamics are a super aggressive road shoe, that’s as much as I can say. You could happily run for a good number of miles on tarmac and on hill sessions, I run 3 miles on road and never feel the need to drive to the hill. Firm, responsive yet plush. I like it. A size 10, weighing in at 250 grams each, for the traction and cushion its a good weight and at the end of the marathon they remained light and responsive. At 5mm drop (22.5/17.5mm) I enjoyed the low, fast feel and clearly am starting to prefer lower drops for longer distances. Would I opt for something with a larger drop for a 50 mile ultra? Perhaps. Aesthetically, I really like the RC range as a whole for its clean lines, distinctive colours and lack of extra for the sake of it. For this reason, I wanted to like the Supertrac RC. And I did. I ran up/down Ben Nevis, had my best race result to date and pushed myself harder in training. Yes, I can’t credit the Supertrac RC with all of this, but I won’t use products on review for racing unless I want to. The rand could potentially have greater protection and I’m still not 100% sold on the insole (of course, you could change them out for your own), but this is where my uncertainties end. At £125 retail, they are an investment, but given the wear so far…. minimal, they should deliver on miles. The pair above have done around 150 miles and remain strong. There’s a whole lot of life in them yet! 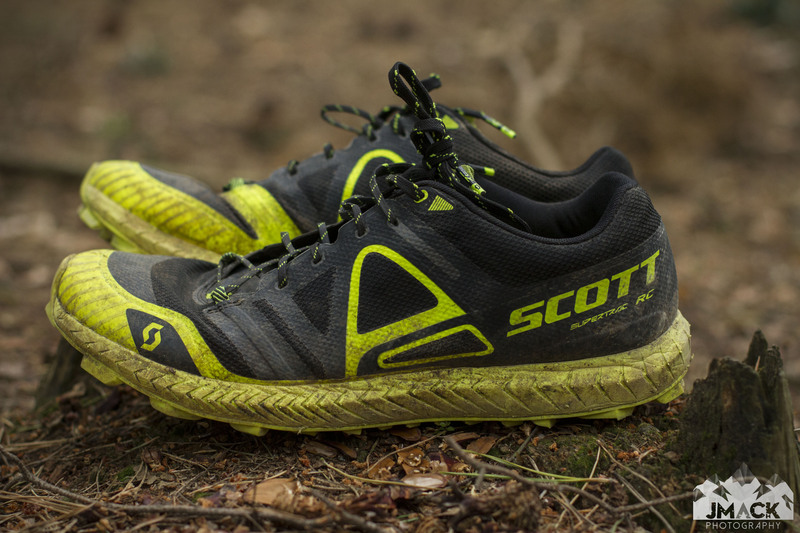 The Scott Supertrac RC may be the choice of Scott’s sponsored pros, however, they deliver to the ever day runner.